Old cities and beaches, seafood and wine! When Condé Nast Traveler asked me to take over their Instagram Stories last weekend and share some of my favourite spots in Malta, I immediately booked the flights. There’s no way I would miss a chance to visit my second home! I’m in the Mediterranean for just a few days at the moment, but it’s enough time to visit my personal hot spots. An early morning boat ride starting in Sliema took me to Valletta to enjoy my first espresso of the day at the beautifully old fashioned Prego Caffe on the capital’s narrow South Street. It’s a beloved morning ritual of many locals, nibbling on buttery breakfast pastizzi filled with ricotta surrounded by the café’s original 60’s decor. A quick visit to the Baroque Saint Francis of Assisi Church (1607) and then I strolled through the streets – one of the most relaxing things I can imagine. If it had been a Sunday, I would have gone to St. John’s Co-Cathedral‘s early morning mass, which is held in Latin accompanied by the most heavenly sounding choir. On the way to my next destination, Casa Rocca Piccola, I stopped by at the peaceful Lower Barakka Gardens. This place always manages to overwhelm me with its stunning views over The Grand Harbour and The Three Cities – and its almost meditative atmosphere. Frances de Piro was so kind to show me around the 400 year old private Valletta palace Casa Rocca Piccola, where she lives together with her husband, the 9th Marquis de Piro who’s a Knight of Malta, and their family. Many of the private rooms can be visited during guided tours and are a must see for everybody who loves art, history, and architecture. My man joined me for lunch, which turned into a little feast at Scoglitti right at the sea at the Marsamxett Harbour facing Sliema. Pasta with Maltese prawns, swordfish from the grill, and a bottle of Meridiana Wine Estate‘s fruity white. Maltese Mqaret filled with dates for dessert and we were ready for a nap. Only the thought of an afternoon swim in Malta’s deep blue waters could stop us from having a siesta. We chose the secluded Delimara bay, limestone rocks and crystal-clear turquoise sea are the best conditions for a good snorkeling trip. My perfect day in Malta wouldn’t be complete without having dinner at Legligin, my favourite restaurant in Valletta offering the most delicious Maltese tapas cooked by our friend Chris. And if it’s a Friday night, you can stroll over to Bridge Bar for their weekly open air Jazz concerts. Sitting on red cushions on the capital’s ancient stairs in front of the bar, sipping on a glass of pastis, and listening to good music make me ask myself why I should ever leave the Mediterranean (sorry Berlin). As a part of the Instagram takeover, I also shared a recipe from my Eat In My Kitchen cookbook on Condé Nast Traveler‘s website. 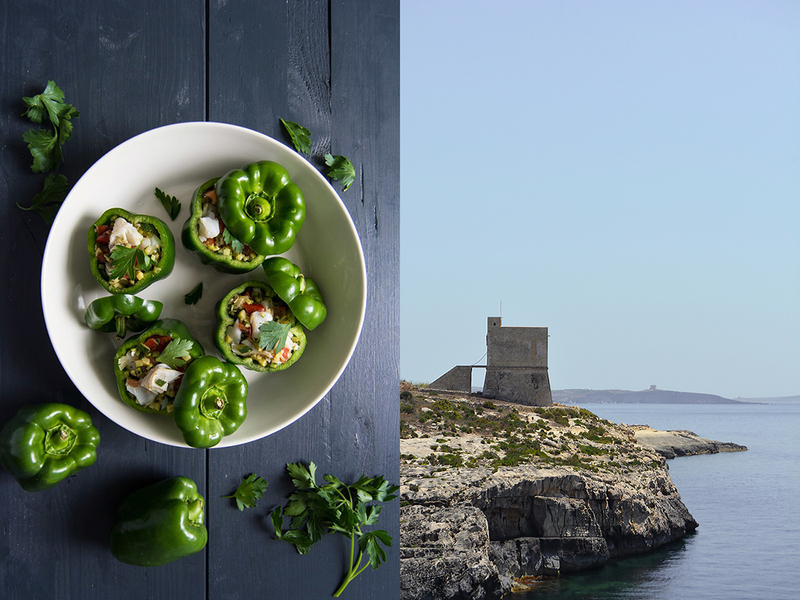 It’s a Maltese classic: stuffed bell peppers. 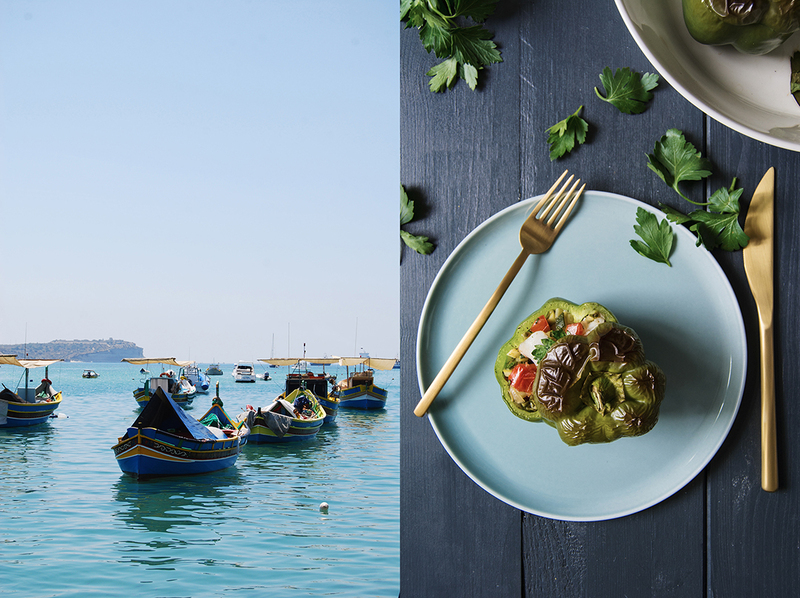 Stuffed vegetables are a staple in every Maltese home. 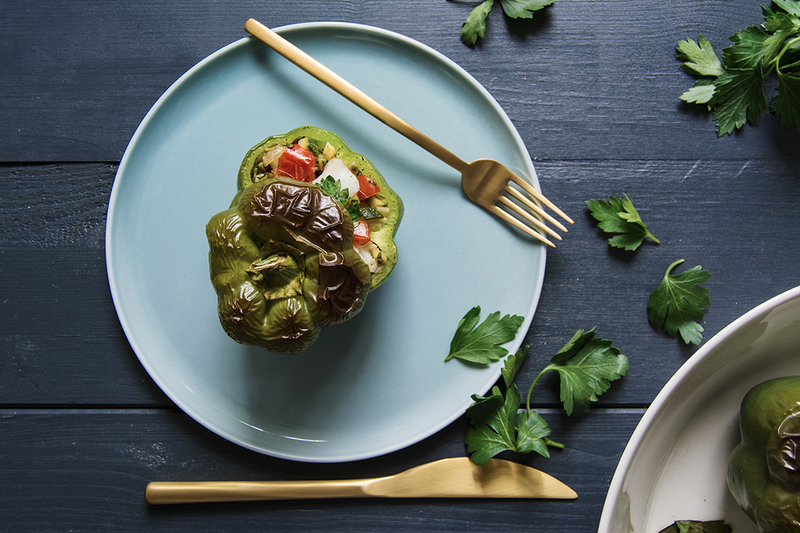 Tomato, zucchini, eggplant, pepper are filled with meat, seafood, or other vegetables and turned into the coziest treat to please a large Mediterranean family’s appetite. In my version, which you can find below, I go for green peppers cooked al dente – I don’t like them too soft and soggy – stuffed with white fish like cod, tiny zucchini cubes, tomatoes, and parsley refined with a shot of vermouth. If you can’t travel at the moment, just cook a dish that reminds you of your favourite holiday spot, close your eyes, and you’ll almost be there. Cut the tops off the peppers. Scrape out and discard the seeds and fibers, then rinse the peppers and set aside. In a heavy pan, large enough to fit the fish, heat a generous splash of olive oil and the butter over medium-high heat. Sear the fish, turning once, for 1 to 3 minutes per side or until golden and flaky—mind that you don’t overcook it. Remove from the heat, break the fish into chunks, and season to taste with salt and pepper. In a large, heavy pan, heat a splash of olive oil over medium-high heat. Add the onion and sauté for 2 to 3 minutes or until soft and golden. Add the garlic and sauté for 1 minute. Pour in a little more olive oil, add the zucchini, and season to taste with salt and pepper. Sauté for about 4 minutes or until soft. Add the vermouth and cook, stirring and letting the alcohol burn off, for about 10 seconds. Take the pan off the heat, stir in the tomato and parsley, and season to taste with salt and pepper. To combine the filling, spread half the zucchini-tomato mixture on a large plate, lay the fish on top, and finish with the remaining vegetables. Adjust the seasoning if necessary. Season the inside of the bell peppers with salt and pepper. Using a large spoon, generously stuff the peppers with the zucchini-cod mixture without pushing on the filling too much. 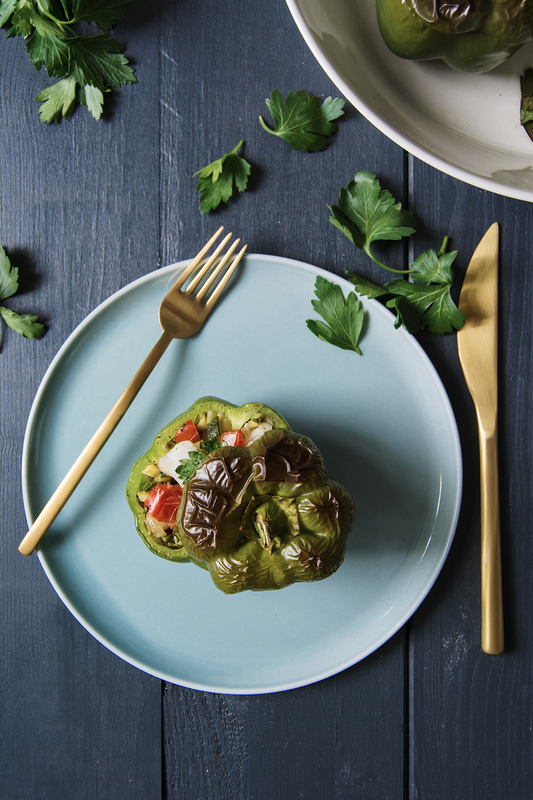 If you have leftover filling, stuff the fifth bell pepper. Place the tops on the peppers and place them in a baking dish. Add a splash of water to cover the bottom of the dish and bake for about 25 minutes or until the bell peppers are al dente and the tops turn dark. Take the peppers out of the oven, sprinkle with more parsley, and serve warm. Hi, I tried this recipe tonight, and it was delicious made with red peppers and hake. My wife and I are heading to Malta for our first visit in May, so we were excited by your observations about the delights of Valletta. That’s great, have a wonderful holiday! 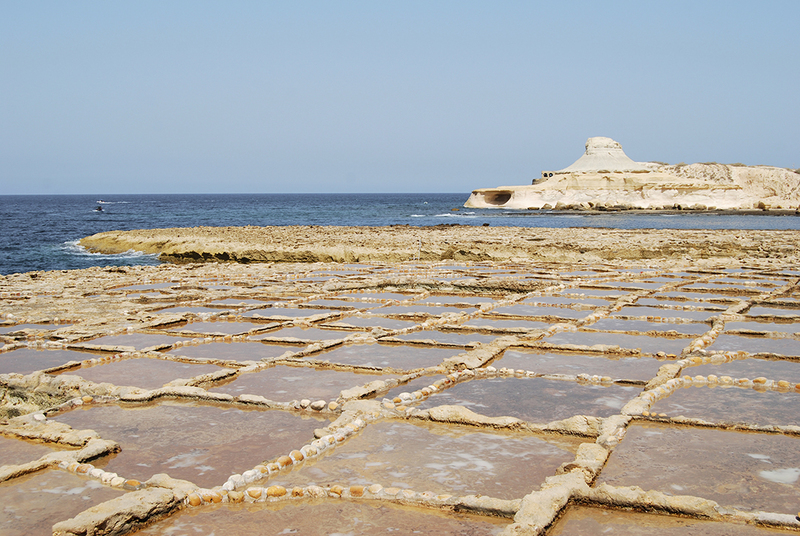 And try to visit Gozo too, it’s more quiet and perfect for snorkeling and diving! I’m glad you enjoyed the recipe!